I found this card haphazardly chucked in one of the boxes while unpacking last night. 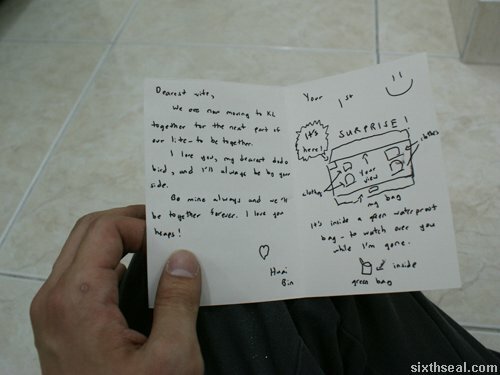 This was written last year when I came over to KL to do some groundwork before moving here for good. I put 7 gifts for her for the week that I was away for her to find, this is the first and only card I have left. When you walk through the door it was clear to me. You’re the one they adore, who they came to see. You’re a rock star, everybody wants you. Player, who can really blame you? Yes, that is my famous cakar ayam! It’s also why I prefer to type than write – banks have been known to reject my signature coz I can’t even replicate my own signature twice. I remember an exasperated clerk showing my signature to me under a UV light and telling me to sign it exactly like I did. I still couldn’t do it. LOL!